A popular mainland Chinese cable TV show that attracts over 100 million viewers per episode continues to strike up controversies across the country. It is similar to a condensed version of “The Bachelor” where 24 eligible ladies express their interests over 5 bachelors in each weekly episode, with the bachelors making their ultimate decisions after a few rounds of shortlists by the ladies. The show’s popularity lies largely on the eligible ladies. Most are attractive models, former beauty peagent contestants or from well off families. Yet like any other reality shows, viewers are mostly attracted by the unrehearsed snappy exchanges on stage. For this show, there are plenty of this, from the bachelorettes. 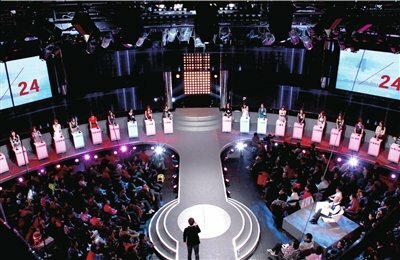 Due to the candid exchanges on screen, the controversial show receives continuous censorship by the national broadcasting bureau on their “materialistic” influences. However, the 100 million and plus viewers who tune in definitely find something that resonates: the overwhelming craving of wealth in today’s China. Worse yet, everyone want to take shortcuts. If you can capitalize on your looks, bodies, youth and social status, do it before it’s too late. There is this oldest Chinese saying, “Laugh at the poor but not at the prostitutes,” that summarizes this prevailing but wicked notion in today’s China. Well, if we are talking about those who are too underprivileged to even make their own living, the measuring stick may need a bit of fine tuning. Though for a substantial portion of the viewing audience, plus those of the wealthy middle classes here in Hong Kong, the alarming phenomenon of generations X, Y and Z circulates around the dream of falling into the comfort of wealth and security right after coming out of college. Paying the dues? Going after my dreams? No, not for me, if there is a bigger meal ticket up for grabs. Dreams are far secondary. Then there is this outcry of eligible ladies in their mid 30s in Hong Kong who complain that they can never find their other halves because no one is good enough for them. Sure they are super eligible. Most of them have successful careers and are financially independent. They look down upon on guys who are indecisive and aimless. They look for men who are secure, even more financially stable, and to top it off, willing to invest in extensive amount of time and efforts to woo them and make them feel like goddesses. That’s not a bad dream, but you would think all that education and life experience would have prepped them to be a bit more realistic and tactful in the lesson of mutual support and give and take. Think about the competition, ladies. Be vulnerable, for once. It’s no business transaction. It certainly goes both ways for sure. Too many men refuse to grow up and prefer to forever stay in our childhood utopia of computer games and instant gratification. That is alright as long as a secure meal ticket is on the table. “No, I just want a job that doesn’t take too much work and effort. I can live with what I make now.” The only thing is that they don’t realize they won’t stay 30 forever. There will always be younger, fitter, and more aggressive new generation coming in and grabbing your jobs, in a second. What’s the future, guys? When young attractive people are going on television not to showcase their talents but to participate in some reality dating shows, I’m not sure whether I should shake my head or applaud them for making a run of fulfilling their childhood fantasies. For many of them, I suspect that marrying someone rich literally is the bedtime story read by their parents.